ANDREW BROCK reckons he couldn’t have picked a better time to produce his most lethal ever bowling stint for Grange. The former captain grabbed six cheap wickets to propel his side to victory over Carlton – and to the top of the table. As Grange were demolishing their Capital rivals, champions Heriot’s unexpectedly surrendered their unbeaten record at the hands of Aberdeenshire. Coupled with a superb century from Dylan Budge, Brock’s effort at Portgower Place made sure Carlton didn’t get a look in. Brock said: “I am sure it was my best return with the ball in a competitive match – and doing it against our biggest rivals made it all the more special. “But it was a quality all-round showing from the team and Budge’s ton was awesome. “There was also tight bowling from the rest of the attack, while the fielding was top notch. Brock added: “I am happy to have contributed to such a strong start to our campaign. Budge’s 100 was the platform for Grange to reach 249 for eight – Nick Farrar also hitting a vital 50. Ali Evans was the pick of the visiting attack with four for 41. Grange player-coach John Blain added: “Andrew has been the unsung hero for a while now. “He is such a positive influence both on and off the park at Grange. “Dylan is a ruthless and talented batsmen. “His hunger and dedication is clear to see, and the rewards are slowly becoming evident. “While these two played a huge part, it was also a solid all-round team display. 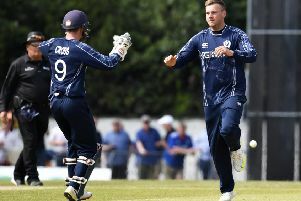 Heriot’s skipper Keith Morton admitted his side deserved what they got – but backed them to waste no time in bouncing back. “Being honest, we probably should have lost by an even wider margin, so it was good to see at least some of our fighting qualities. “I have no doubt that the boys will shake off this setback. RHC Lions dominated the north Edinburgh derby with Stew-Mel at Inverleith.